Green building in South Africa is growing at an unprecedented rate and has now overtaken that of established sustainability building regions such as Europe, Australia, United States, United Arab Emirates, Singapore and Brazil. According to a report on the Moneyweb website, this fact has been confirmed by United States-based McGraw-Hill Construction in its World Green Building Trends survey. The report states that while South Africa is only now catching up to to its developed and developing counterparts the survey rates that green building in South Africa has grown three-fold in the past couple of years, from a measured 16% in 2012 to 52% by 2015. A total of 60% of firms in the survey reported future green commercial developments by 2015, while retrofits came in at 58%. Leading the way towards green building in South Africa is the Green Building Council of South Africa (GBCSA). The GBCSA is an independent, non-profit, membership-based organisation that was formed in 2007 by leaders from all sectors of the commercial property industry. The Council is a full member of the World Green Building Council and the official certification body of buildings under the Green Star SA Rating System. 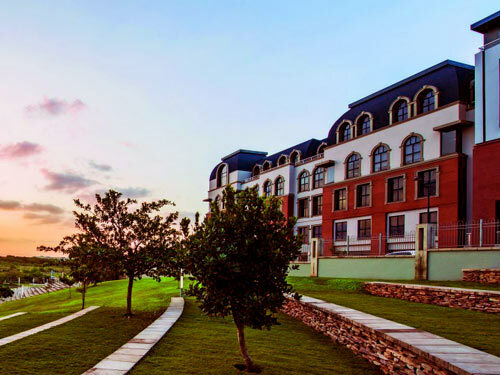 The aim of the GBSA is to ensure that all buildings are built and operated in an environmentally sustainable way so that all South African's work and live in healthy, effective and productive environments. According to the GBSA, buildings are one of the main contributors to climate change. Building green is an opportunity to use resources efficiently and address climate change while creating healthier and more productive environments for people and communities. To this end the GBSA has instituted a rating system to objectively assess just how “green” a building is. Rating systems provide a menu of green measures that can be used in the design, construction and management of a building to make it more sustainable. The Council uses the Green Star South Africa rating system, based on the Australian green building rating system and customised for the South African context. Building owners submit documentation to the GBSA to achieve a Green Star SA rating. Independent assessors evaluate submissions and allocate points based on the green measures that have been implemented. Certification is awarded for 4-Star, 5-Star or 6-Star Green Star SA ratings. To date there are 34 buildings rated in the 4-Star category; 13 in 5-Star and three as 6-Star. The buildings ranked comply with the criteria of using green and innovative technologies including efficient energy and water use, waste disposal, the use of recyclable materials in construction, sustainable use of space and use of natural lighting. Buildings that have achieved the 4-Star green rating include Sandton’s Alexander Forbes, Nedbank’s head office, Alice Lane Building 1, Worley Parsons building at Melrose Boulevard and more. The 5-Star rating has been awarded to, among others, Standard Bank’s head office in Rosebank, DSTV City in Randburg which is still under construction and Group Five’s head office within the Waterfall commercial business park. The 30 654 square metre Department of Environmental Affairs building in Pretoria made the cut to achieve the prestigious 6-Star rating – a category considered in line with international best practice.